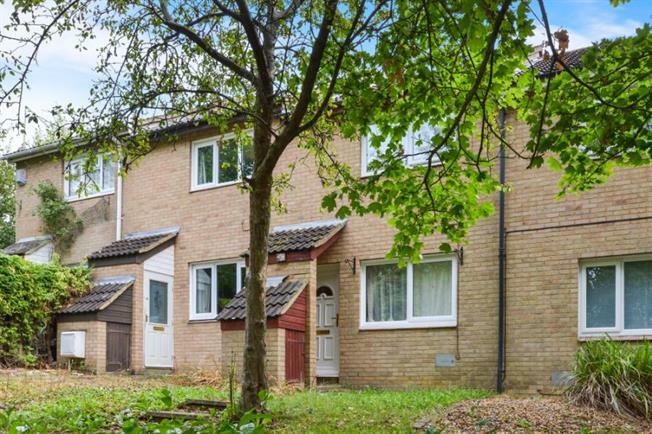 2 Bedroom Terraced House For Sale in Milton Keynes for Offers in excess of £195,000. This two double bedroom property would be a perfect purchase for a first time buyer or investor. In brief this property comprises of a large lounge area, spacious kitchen, two double bedrooms, family bathroom, front and rear gardens and an allocated parking space. A Viewing is highly recommended. Window to front aspect, wood effect flooring, stairs rising to first floor landing, TV point, two radiators and coving to ceiling. Window to rear aspect, doors to rear aspect, range of low level and eye level base units, roll top work surfaces, stainless steel sink with drainer and mixer tap, space for fridge/freezer, space for oven and radiator. Doors to bedrooms one and two, storage cupboard, loft access and door to bathroom. Window to rear aspect and built in storage cupboard. Radiator, low level WC Wash hand basin, panelled bath with tiling to splashback areas and mixer tap. Mainly laid to lawn with gated rear access, enclosed by timber fencing, patio area and rear access leading to allocated parking to the rear.